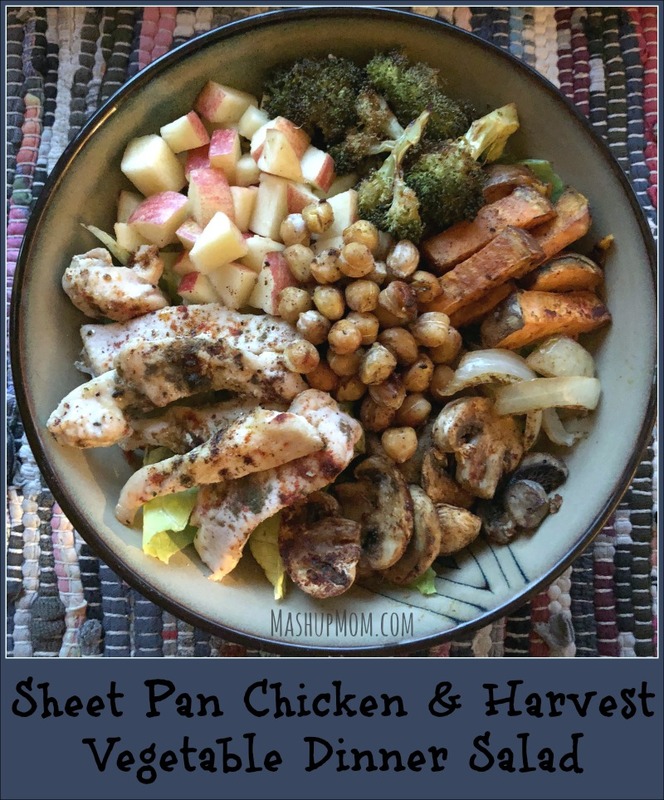 Roasting the veggies in this naturally gluten free Sheet Pan Chicken and Harvest Vegetable Dinner Salad helps bring out their inherent sweetness, while a touch of cinnamon and sage adds a fall feel to your bowl. 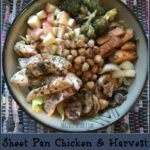 Next up in our semi-random series of “recipes to throw together with various odds and ends of veggies,” we have this tasty and fall-full Sheet Pan Chicken and Harvest Vegetable Dinner Salad. 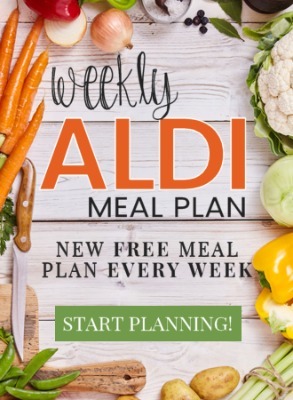 AKA: What you might make when a perusal of what’s available reveals one lonely sweet potato, the remnants of a pack of broccoli crowns, half an onion reaching the end of its natural lifespan, and romaine that’s starting to turn a little rusty. The end of a produce week is is how happily accidental recipes are sometimes born! And, this salad would be pretty easy to change up with whatever odds and ends of harvest veggies you have available at your house this week. Try butternut squash instead of sweet potato, use cauliflower instead of broccoli, or try subbing in some Brussels sprouts for one of the other veggies. Alongside all of these random vegetables that needed using up, I just added in some chicken and mushrooms (because I had them), chickpeas (because roasted chickpeas are awesome on salad), and apples (for a sweet and crunchy contrast). A few fall seasonings later, and voila: Four filling bowls of dinner salad packed full of chicken and harvest veggies! Cut up the chicken, sweet potato, mushrooms, onion, and broccoli. Rinse and drain the chickpeas. 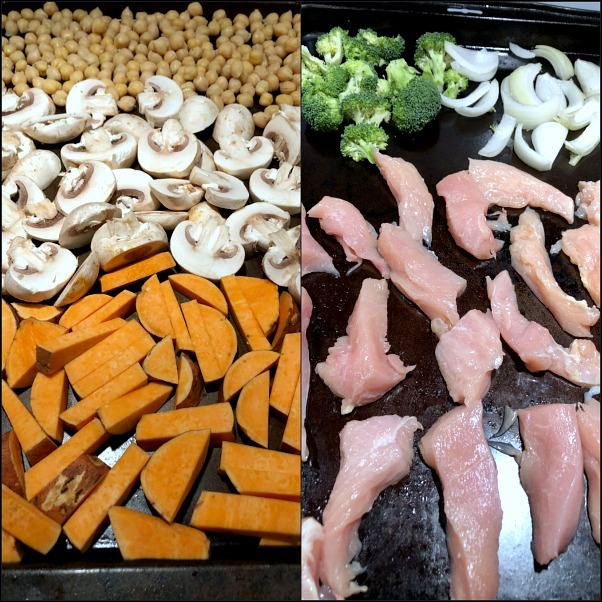 Arrange the chicken, chickpeas, and vegetables across two rimmed baking sheets. 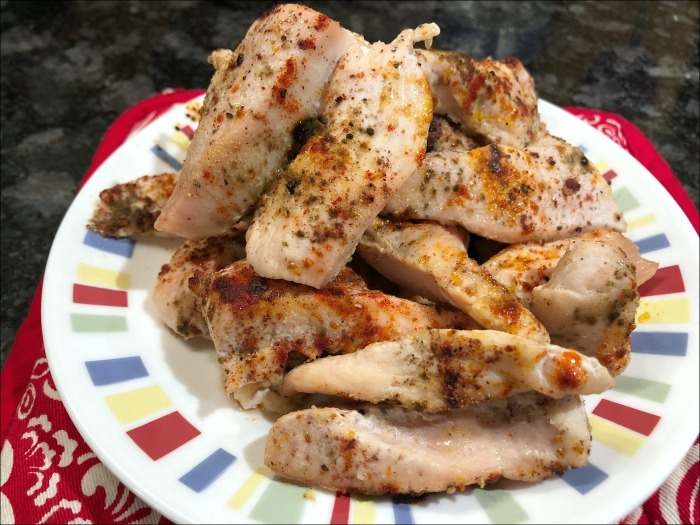 Drizzle the contents of both pans evenly with olive oil, then season them with seasoned salt, smoked paprika, sage, garlic powder, cinnamon, and black pepper. Roast the chicken and veggies at 425 degrees for 17-20 minutes, or until chicken is cooked through. Remove chicken from the pan to a separate plate. 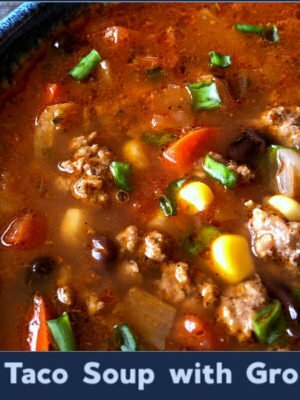 Stir the vegetables and combine them onto a single pan, then return veggies to the oven for another 10-15 minutes, or until sweet potatoes are cooked through and tender. While the vegetables are finishing up, chop the lettuce and apples. Survey says? This was a filling fall salad, indeed. Roasting the veggies helps bring out their inherent sweetness, and the cinnamon and sage work together to add a fall feel to this recipe. If you want to get a little fancier or add another pop of flavor or color, dried cranberries or candied pecans would be a lovely addition (as would crumbled bacon) — but then again, that’s true of most salads, right? 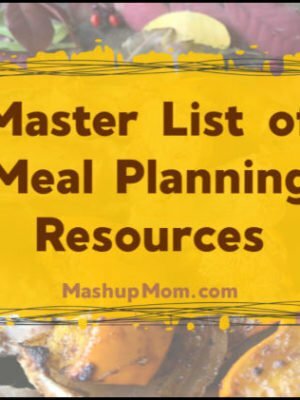 Sheet pan chicken & harvest vegetable dinner salad is naturally gluten free. Four filling bowls of dinner salad packed full of chicken and roasted harvest veggies, with fall-inspired seasonings! 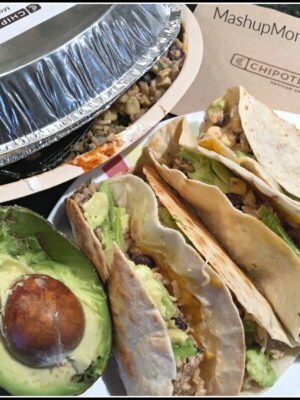 Divide chopped romaine evenly among four large bowls or dinner plates. 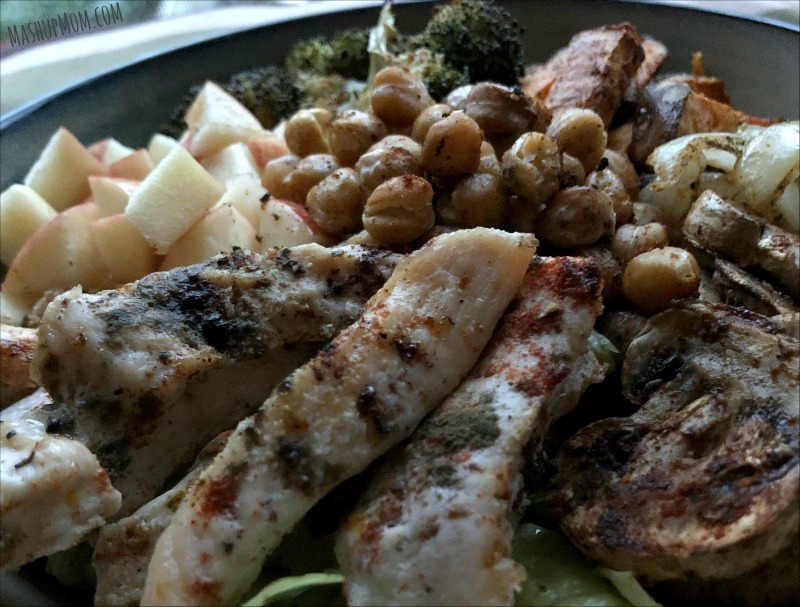 Top each bowl with chopped apple, chicken, chickpeas, and roasted veggies. Never in a million years would I have put this combination of spices, chicken, and veggies together and then put it over salad on top of that. This was delicious! 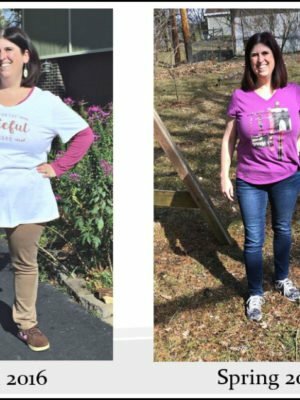 Thank you for prompting me to try something new!